David Shiffman, 28, takes ahold of a lemon shark in the Everglades National Park. The species’ name originates from its yellow coloration. A natural reaction upon seeing a shark is run! Hide! Swim away as fast as possible! Not so with David Shiffman. Born and bred in Pittsburgh, Pa., where the closest in proximity he came to the predators was through the glass panes of a local aquarium, Shiffman now studies sharks in the flesh in Miami. Below, the shark conservation biologist and blogger takes a deep-dive into the dangers of his job—and the dangers of shark fin soup. Graduated from: Duke University, biology degree with a concentration in marine science; College of Charleston, Master’s in marine biology. “Now, I’m at the University of Miami getting my Ph.D., and a student at the R.J. Dunlap Marine Conservation Program and the Abess Center for Ecosystem Science and Policy. What first drew you to sharks? Most little boys – and girls, too – have a thing for sharks and dinosaurs. And I just never grew out of mine. How would you sum up your job in a few sentences? 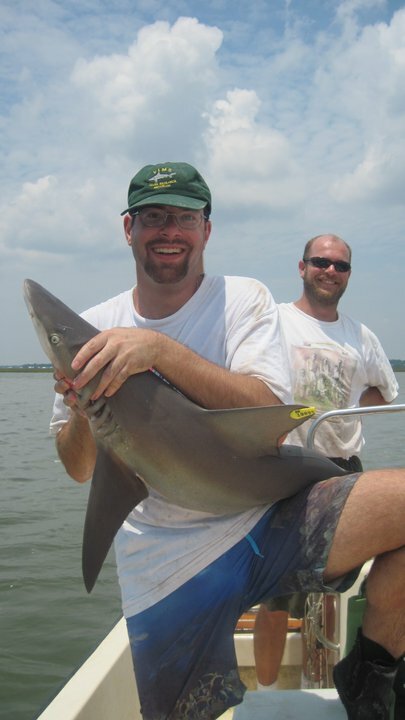 I’m studying how sharks fit into the marine ecosystem and why they’re important to the ocean. I want to dedicate my entire life to being a university professor doing university-level research on this. So, I’ll ask the obvious: why are sharks important? Most predators are important to keeping the ocean balanced. The decline in shark population affects the entire food chain. Sharks are one of the most endangered groups of animals in the world; scientists have observed population declines of 90% or more in some species in areas where they were once abundant. The biggest drivers of endangerment: The demand for shark fin soup is the single largest driver for overfishing, without a doubt. Bycatching is probably the second-largest issue facing sharks—that’s when you’re trying to catch one species of fish, but you accidentally catch another near your target. Millions of sharks a year are victims of bycatching, and often die even if released back into the ocean. Do you physically handle the sharks? Yes. Every time I’m out on the boat catching sharks, I get a thrill. Our primary protective gear is closed-toes shoes—no flip-flops—and sunglasses and sunscreen. Most people think of sharks in the context of shark attacks. Does that make it difficult to gather support for shark conservation? Yeah, you have a one-in-five chance of dying from heart disease, but a one-in-five-million chance of dying from a shark attack. No one is afraid to go to a fast food restaurant, but a lot of people are afraid to go in the water. 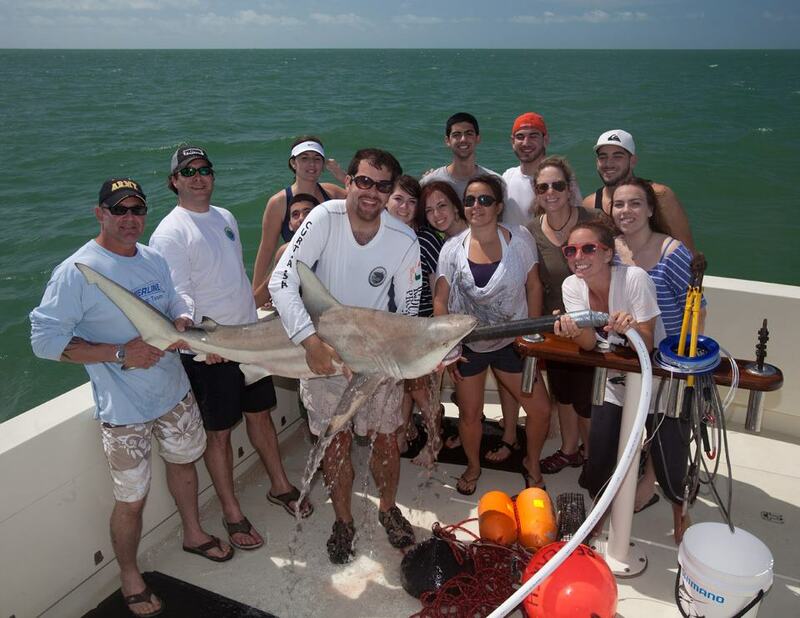 One of the student groups with Shiffman’s crew on the boat, after catching a blacktip shark. The pump in the shark’s mouth helps it breathe on dry land. Best part of your job: When we take students out on the boat with us. Last year, our lab took over 1,000 high school students from around the country out into the field to help with our research. Our boat can accommodate up to 20 guests, in addition to our crew. I love getting to see a shark through the eyes of a kid who’s never seen one in the wild before. I’m guessing their eyes are often filled with fear. Well, most people grew up being afraid of sharks. Even if high school students haven’t seen Jaws, their parents have. So, yes, some are excited and some are nervous when we pull a big shark onto the boat. Did you grow up afraid of sharks? Not really. Pittsburgh is pretty far from the ocean, but the aquarium there had some great shark tanks. I used to sit there all the time. Most challenging part of your job: The hours. An article in Forbes called university professors one of the least stressful jobs around, but that’s nonsense. None of my colleagues work fewer than 50 or 60 hours a week. What would people be surprised to learn about your job? It’s not that scary. People always ask if I’ve ever been bitten, and the answer is no. Most of my photos of sharks—that I’ve snapped while scuba diving or snorkeling—are of the sharks swimming away. They’re scared of us. I was seriously injured once, but it wasn’t because of a shark. I accidentally put a giant fishing hook through my hand. 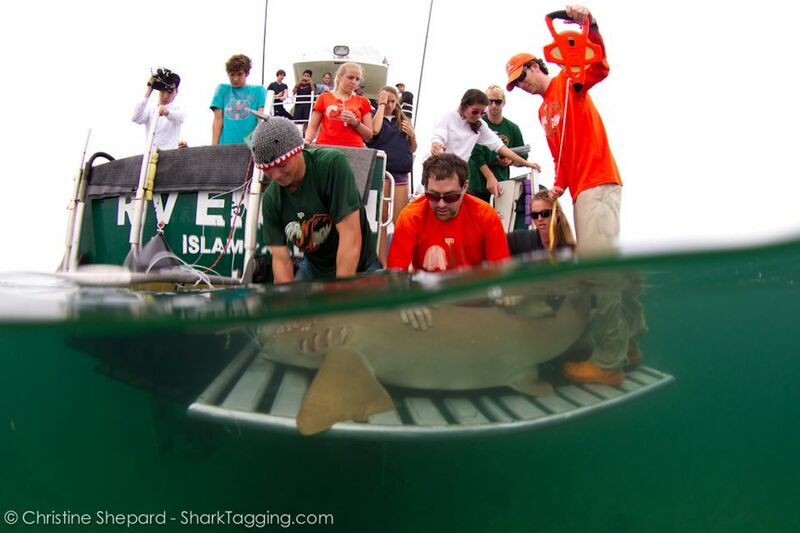 The biggest shark you’ve ever encountered: We recently caught a bull shark that was about 9 feet long and 400 pounds. But we’ve caught bull sharks almost twice as heavy as that. 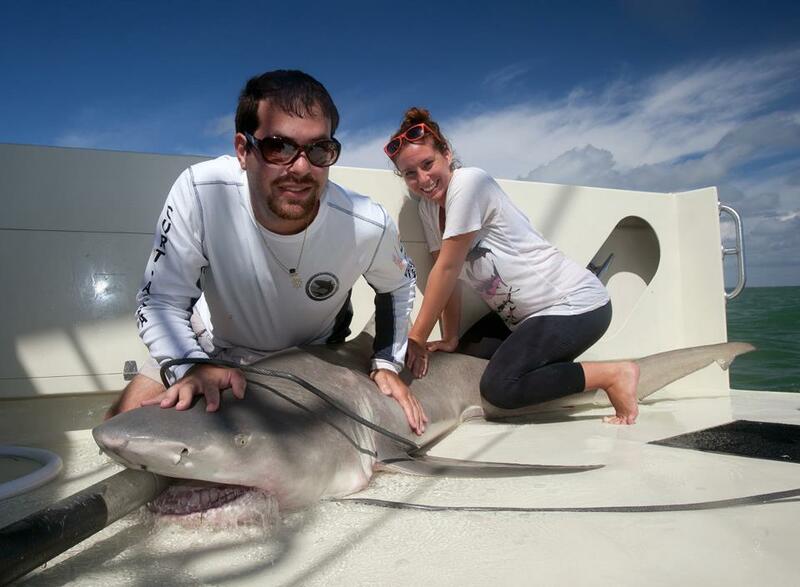 The biggest shark I’ve ever caught was 13 feet; the biggest shark the lab has ever caught was a 16-foot tiger shark. The sandbar shark (pictured here in Charleston Harbor, South Carolina) is one of the biggest coastal sharks in the world. You’re very vocal on Twitter. How do you see the platform helping your work? I’m very involved in the online communication of science, both through my lab and through my personal blog and Twitter. The Internet is great at spreading correct information, but it’s also great at spreading rumors and lies. Twitter must-follows: That list would be longer than the rest of this interview. There’s no way to list just a few people without someone feeling left out—and I will get phone calls about it. People interested in learning more about sharks should follow the hashtags #SaveSharks, #Shark, and #Sharks. How should government play a role in saving sharks? The solution is a sustainable global fishery that is well enforced by quotas and rules from a responsible government. It doesn’t fit on a bumper sticker, but that’s the solution. People can help by lobbying the government or getting involved with responsible conservation organizations that are already lobbying the government. Your dinner plate at seafood or sushi restaurants includes: In southern Florida, local mahi-mahi and stone crab are some of the most sustainable fish around. I avoid most kinds of tuna, and Chilean sea bass and red snapper are usually trouble. Sustainable seafood means it’s been harvested in such a way that it doesn’t harm the population of fish or damage the environment. Study hard and do well in your math and science classes. You know that stuff you learn in math or science class that people say, “When are you ever going to use this?” Well, I use that stuff every day. Also attend scientific conferences—and ask questions. Or simply ask me questions on Twitter at @whysharksmatter. Unless noted otherwise, all photos courtesy of David Shiffman. Next up in seafaring No Joe Schmos: the professional mermaid. This entry was posted in Cool jobs, Crazy jobs and tagged ocean conservation, scuba diving, shark conservation, sharks, sustainable seafood, why sharks matter, working with sharks by Megan Hess. Bookmark the permalink.